Jet Lag can ruin a trip. Learn how to beat jet lag and its effects next time you travel. And how to maximize your time and effectiveness in this free guide. Jet lag. Those two words cause dread for many people. Especially those who don’t have lots of time to catch up and adjust to a new time zone. Is there any way to avoid it? To counteract its effects? There actually are and we’ve pulled all the best science and latest discoveries into a free guide for Kindle, iBooks or Acrobat! The most important thing to remember is to start with a plan. Your “body clock” is keyed by exposure to light, temperature, food/hunger, social environment, stress levels, noise levels, and adrenaline. If you can, begin counteracting jet lag before you even leave! Move your bedtime forward or backward gradually beginning a few days before you leave (google “timeshifting”). Change your eating schedule and work schedule as well, if possible. And your social calender. This will take your timeshifting to a whole new level. Of course, if you are going to the other side of the world and your nights and days are going to be completely flipped, you can only do this for maybe 4-5 hours. But there are a lot of other things you can still do, and they are all in this Jet Lag How-to guide. Especially if you’re flying a long distance, plan to land in the evening so that you can get to your hotel, eat, shower, and go to bed. I have personally found this to be especially helpful. Related to this, if you’re landing at night, it’s better to be tired when you land, rather than wide awake, so err on the side of sleeping too little rather than too much. Do not plan to socialize that first evening. You want to rest. If you’re landing in the day time, get out in the light and take a walk or a light jog. Do plan to see people, but you probably don’t want to plan any important meetings, unless you’ve gotten plenty of sleep on the plane! 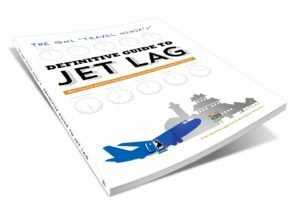 Download the guide for free at https://www.gninsurance.com/free-guide-on-preventing-jet-lag/ and learn more! From the guide: When flying long distances, try to arrange a layover where you can shower, sleep for a few hours (depending on the local time), walk around, and charge your electronic devices. Additional travel tip: If you have a really long layover, check and see if there are day tours that go out into the city from the airport. I know that Taipei has this. They have a tour that leaves in the morning, and another one right after lunch. This actually allows you to get out of the airport, and be in the sun, which is important to change your body’s clock. If you have a shorter layover and are trying to stay up, look around your airport and see if it has a museum, or even a small art exhibit of some kind. Many large airports have them, and it gives you an opportunity to look at something, keep your mind engaged, and stay moving. Consider doing these things on your next trip, and let us know if they worked! Happy traveling!